If you’re looking for a new type of paver for your outdoor patio, driveway or pool deck, travertine is one choice you should surely consider. It’s a 100% natural earth product that is formed when water passes through limestone, depositing calcium and releasing carbon dioxide. Travertine pavers have a variety of benefits making them ideal for pool decks. 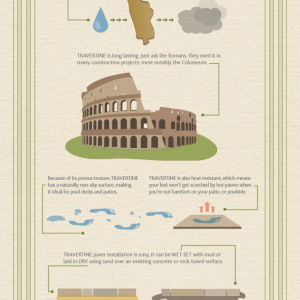 Here is an infographic explaining the benefits of travertine pavers and the easy installation process. 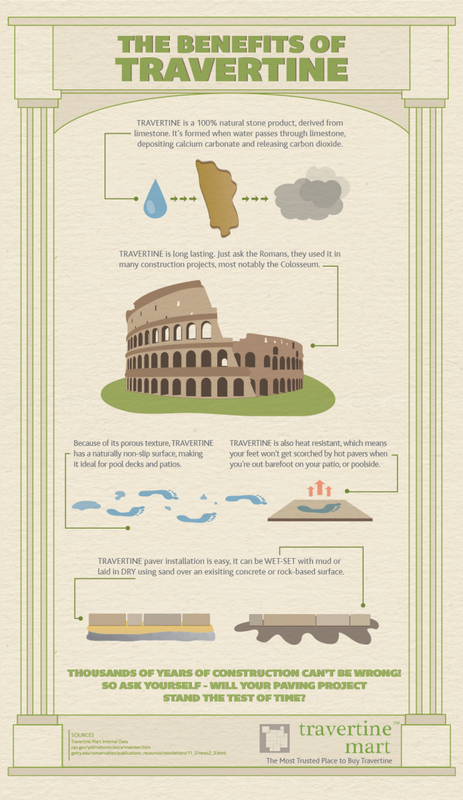 If you need proof of how long travertine can stay gorgeous and hold up to daily wear and tear, just ask the Romans. Many of their construction projects, most notably the Colosseum, were made out of travertine and are still magnificent architectural features today. Other types of pavers can be slippery when they’re wet, which can be problematic around pool areas. Travertine, however, has a porous texture, which provides a naturally non-slip surface. This makes travertine pavers an ideal choice for pool decks and patios. There’s nothing worse than scorching hot pavers when you’re walking around your yard or patio barefoot. But travertine pavers don’t get hot, so your feet will stay cool no matter how high the mercury climbs. If you’re the DIY type, you’ll love how simple it is to install travertine pavers. Pavers can either be wet-set over an existing solid surface like concrete or dry-set using sand over gravel or lime rock. Travertine paver installation is easy. Next time you’re ready to jump into a home makeover, ask yourself if travertine can get the job done. Chances are, it can! A Closer Look At The Advantages of Travertine Pavers Important Things to Know Before Purchasing Travertine Pavers The New Travertine Mart Website is Here!